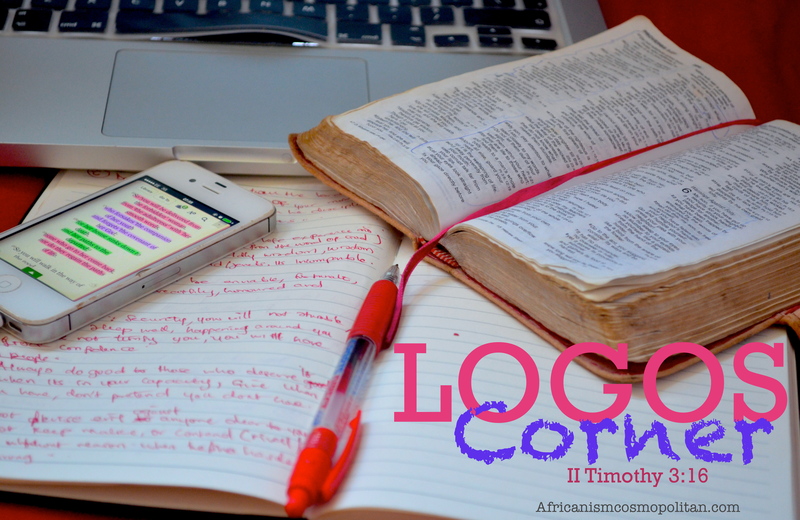 As usual, get your bibles, gadgets, notepads and lets begin…..Welcome to Logos corner. This week I had a major setback in my walk in God. I have never felt so condemned, even though I have a good understanding that the ‘guilt’ I was feeling was conviction and not condemnation. I felt I cheated on the HolySpirit (I don’t know any other phrase to describe exactly how I felt except from that). I felt like a complete sinner. You may be wondering how come I’m being so ‘expressive‘ but I know this will reach someone and they can understand that they are not alone. Sometimes in our walk with God we totally ignore the signs and the warnings God gives us through the Holy Spirit, simply because at the moment, the flesh seems so insatiable. Tosin saw all the warnings, I knew I was making the wrong decisions, I knew the consequences, but still I allowed myself follow suit. Its quite amazing how direct the Spirit of God can be…….. In my soberness I heard the HolySpirit clearly saying, “I told you!, Tosin I warned you!” ………. But at that moment I felt as though the anointing of God had left me, I felt as if I’ve broken the hedge God placed around me, I literally felt like the fire was quenching. But I thank God for the spirit of understanding and his mercy. In my reflection I understood that the devil is very out to get the children of God and everyday of your life is a spiritual warfare as a believer. When you begin to walk uprightly, your light shines so bright the devil can obviously see it. Therefore, he sends people, emotions, temptations, habits, jobs, sickness to try to dim that Light, and a believer who has no discipline/is disobedient may unfortunately fall prey. This week as I dealt with my conviction one thing that stood out to me was the word of God already embedded in my heart(importance of meditating on the word). Even when I was afraid and unconsciously letting my setback have dominion over me, I found myself repeating scriptures, I said “the devil is a liar” repeatedly. Although now I look back its quite funny but then I meant every word in that phrase. The holyspirit brought to my remembrance scriptures like Hebrews 4:16 “Let us then approach God’s throne of grace with confidence, so that we may receive mercy and find grace to help us in our time of need.” and Galatians 4:7 “So you are no longer a slave, but God’s child; and since you are his child, God has made you also an heir”. The latter even struck harder because I really felt weak spiritually, and I needed to remind myself that I was a child of God, joint heirs with Christ, hence a condemnation/pity party is not my portion. One thing I also did to manage my emotions was to be accountable to someone and not just the Holy Spirit. The bible says in James 5:16 “therefore confess your sins to each other and pray for each other so that you may be healed. The prayer of a righteous person is powerful and effective“. In totality what am I saying? Sometimes as Believers we fall. Without offence there would be no need for forgiveness, but God has put forgiveness in place by his mercy and grace which is always sufficient for you and I. If there are ever days the devil is trying to make sin seem like it has a hold on you, I want you to confess the word of God to that situation understanding that God is ever faithful even in our unfaithfulness. See every experience as its purpose is for a greater good. You are a believer who loves God, therefore all things work together for your good. “But he said to me, “My grace is sufficient for you, for my power is made perfect in weakness.” Therefore I will boast all the more gladly about my weaknesses, so that Christ’s power may rest on me”. Have an amazing, fearless life, God really does love you! A scripture that comes to my heart reading this post is proverbs 23:16- ‘for though the righteous fall seven times, they rise again…. ‘God bless you for sharing. God bless you my darling sister!! more grace to you and thanks for your support always. I appreciate you. Amen! My pleasure. God bless you too. Keep shinning! I am indeed blessed by this. Thank you so much dear for taking out time to read, God bless! Really Tosin.. I can relate totally with this! i also felt a setback in my mind too some days back just because i choose to allow my body dictate to me. But God is faithful ,he rebuked me softly through the holy spirit and then he led me to see how devil the accuser of the brethren never seize to look for whom to devour. God is crazily faithful and he’s so full of Love and mercy. I’m so glad you could relate, thank you for reading and also commenting, I really appreciate you Ope. Thank you, and a big ‘OH YES’ to how faithful God is, he truly he’s a God of love, mercy and most especially GRACE!………I hope to meet you soon ^.^ much love“! Tosin,; thanks for this post..I couId reIaate to it.